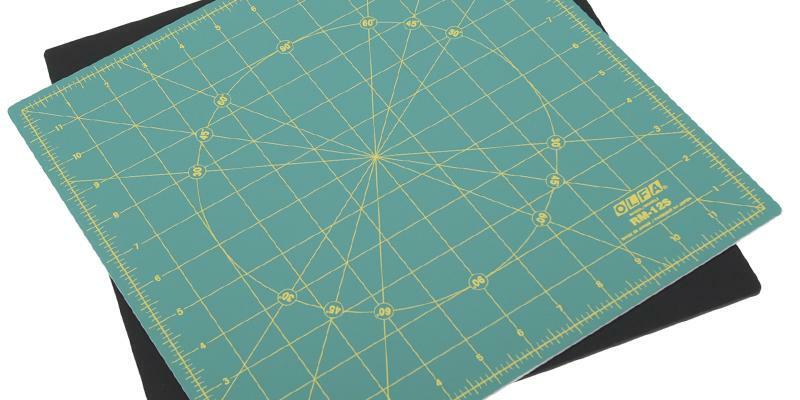 This fantastic self-healing cutting mat has a rotating top. It allows the most comfortable shaping, including compound. 17" x 17" Available: 12" x 12"
Owing to its large size, the Fiskars rotary cutting mat effectively protects any working surface. In addition, you can easily cut out shapes of almost any size. It might emit a specific smell for a short period. A wonderful choice for experienced artisans and beginners alike. 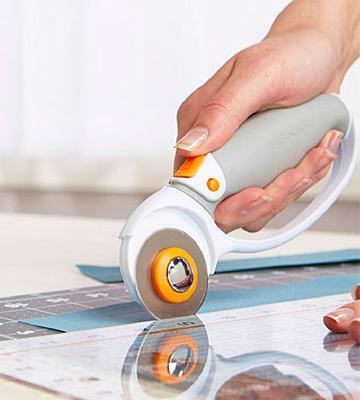 The Fiskars self-healing cutting mat will become an irreplaceable aid in your workroom for years! 24" x 36" Available: 18" x 24", 12" x 18"
As comfortable as it is, the Alvin self-healing cutting mat is produced using high-density materials. It withstands even the cuts made with a high pressure applied. The markings are a bit far from the edges. It is the best choice for the masters of the craft! You will appreciate working on this super-strong and durable cutting mat with all kinds of instruments and materials you may need! 18" x 12" Available: 12" x 8.5", 24" x 18", 36" x 24", 42" x 30", 48" x 36", 60" x 40", 80" x 40", 96" x 48"
With its 15-layers structure, the Calibre cutting mat quickly recovers from the cuts. At the same time, it will keep your knife blades sharp. Due to its high density, the item is a bit heavier than other models. This awesome self-healing cutting board is absolutely safe even for 3-years-old children, and it has no odor (EN 71-3 compliant). A wonderful choice for those who care of their health! 24" x 36" Available: 18" x 24", 12" x 18", 9" x 12"
You can choose a relaxing green with yellow markings or vivid blue with white markings side depending on the lighting and material pattern. 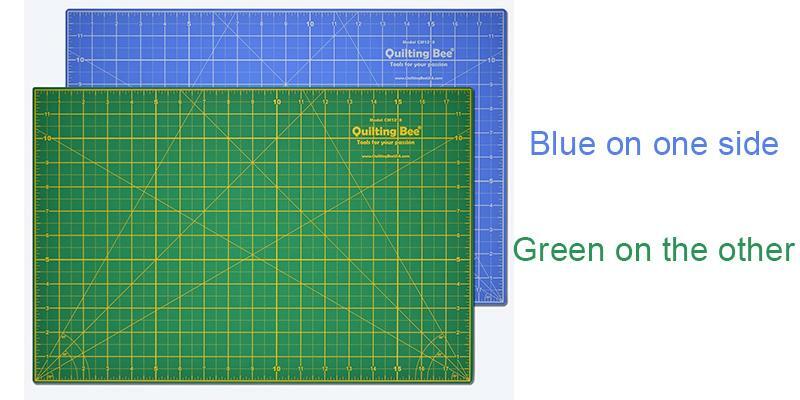 Thanks to the precise marking and durable structure, this wonderful self-healing cutting mat is the best choice for quilting and scrapbooking. 12" x 18" Available: 18" x 24", 24" x 36", 9" x 12"
The Olfa engineers have been working hard to ensure their cutting boards deliver efficient performance. You only need to choose the right size to match your working surface and cutting out various shapes on it will be a breeze. Those people who have once tried using it for work cannot but give high value to the quality of the material and board itself. Due to the rotating feature, working with it requires minimum effort and strength, the mat can be angled in any position to enable more precise cut. There are inch grid lines and 30°, 45°, 60°, 90° angle markings. 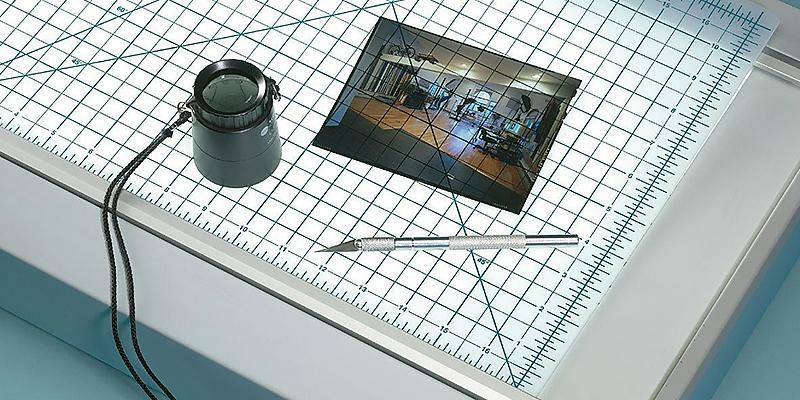 This wonderful self-healing cutting mat allows making the most accurate measurements. Owing to the non-slip bottom layer, the cutting mat does not skid off the table. Restful green mat color prevents the item from glaring in the desk lamp light and reduces an eye strain caused by sustained work. Why do most artisans prefer Olfa cutting tools? The secret of their popularity is in high quality of all their products. 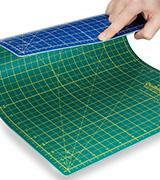 The Olfa cutting mats boast a wonderful self-healing feature, which means that the elastic surface closes up the cuts. Moreover, it does not affect a future cuts precision, the self-healing cutting board works just like new! The unique manufacturing technologies and high-quality materials work for the item’s durability and perfect density. As a result, the cutting blades stay sharp for a long while. No wonder that many people prefer using the Olfa cutting mats, they are definitely the best choice for craftspeople, designers, and engineers! In 1956, Yoshio Okada founded the Olfa Company to manufacture utility knives, in Japan. They started with ten employees and only few power tools. Today, the company is renowned all over the world as the largest cutting tools manufacturer. Olfa engineers had invented and presented to the world a segmented blade utility knife that does not require sharpening. Along with the knives, the company is famous for its blades, cutting mats, rulers, and scissors of the highest quality. The gray color of the cutting mat isn’t exactly bright but no less comfortable during use. 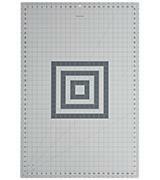 The grid features inch-markings and angles for the most precise cutting. 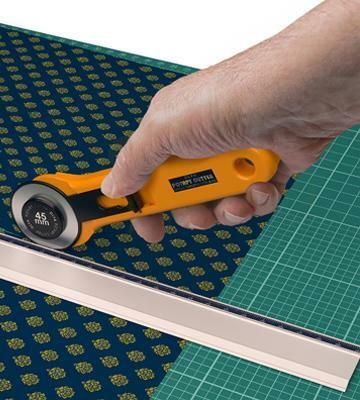 This cutting mat isn’t bound to any particular use, but according to our findings, it’s extremely popular among craftsmen who often deal with fabric. This isn’t surprising actually, for its dimensions allow users to lay on it both small and big clothes easily. The novice also like the dual working surface. 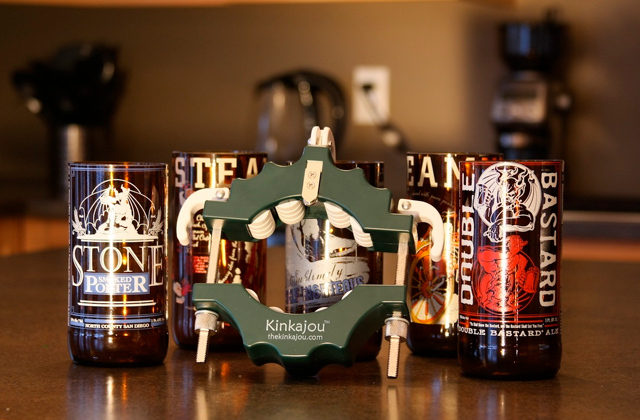 It doesn’t slip on a smooth table and enables precise multiple cuts at the first attempts. 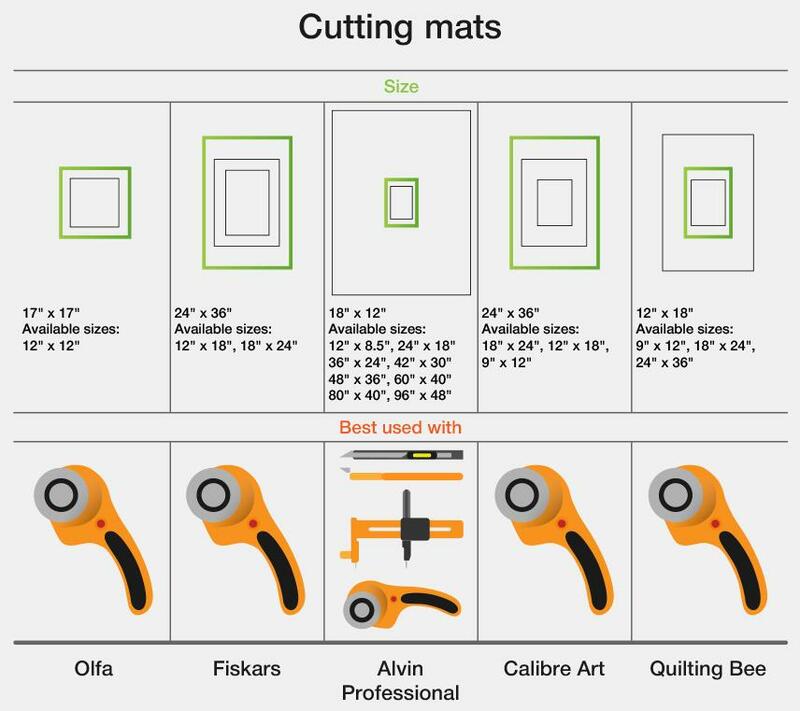 Owing to high-quality materials and innovative technologies, the Fiskars self-healing cutting mats are both lasting and convenient to use. The self-healing feature ensures durability - after all the cuts done it still looks just like new! However, you should follow some simple rules to maintain it properly. First of all, bear in mind, this cutting mat was designed to be used with rotary cutters only. 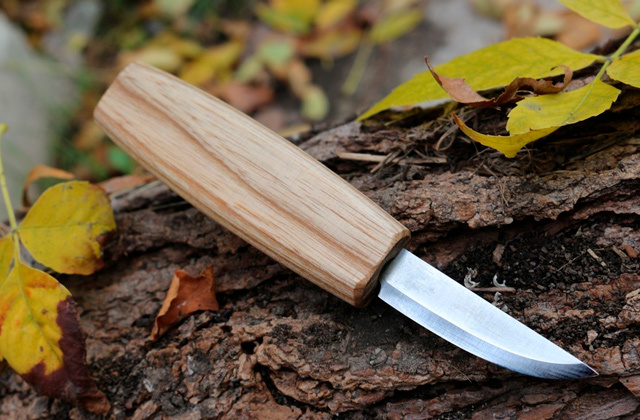 Fixed-blade knives are not recommended since they can easily damage the cutting mat surface. Please do not fold the item; it should be stored flat and kept out of direct sunlight. 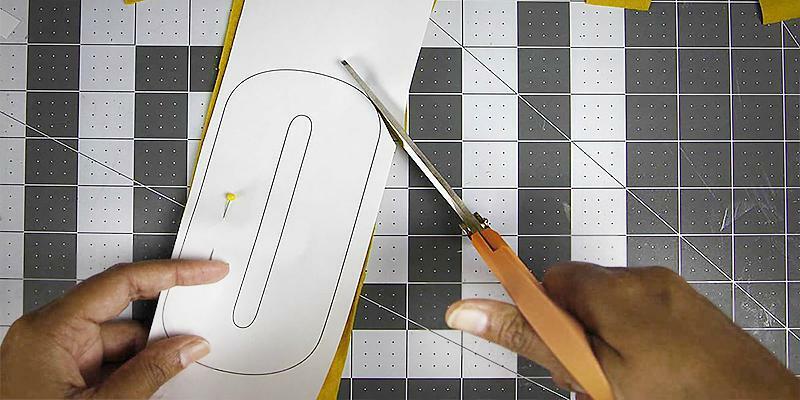 If you don't ignore this simple advice, Fiskars self-healing cutting mat will serve you faithfully for ages! Here are some tips on the item's transportation. 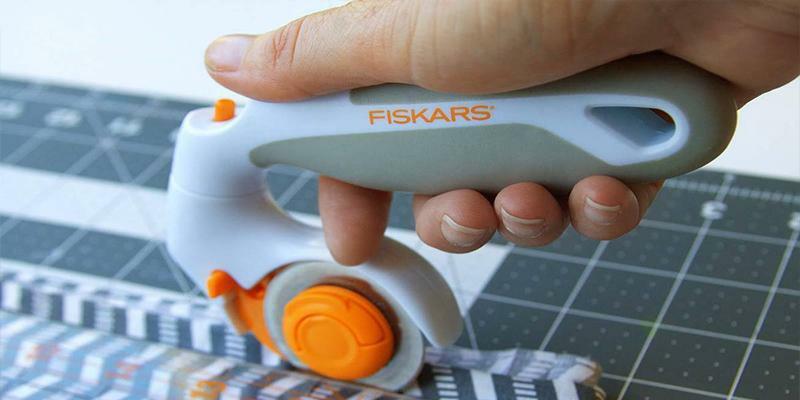 As we have already mentioned, the Fiskars rotary cutting mat should not be bent and fold. However, it has rather large dimensions. That is why it is worth getting a hood for the cutting mat transportation. On the other hand, you can make one by yourself; with this craft mat, creating a stylish tote is a breeze! Ask professional artisans, designers, or anyone skilled in handicrafts, which cutting mat to choose. The answer is most likely to be the Alvin self-healing cutting mat! This amazingly strong and durable art mat recovers from cuts made by all kinds of knives. All masters of their craft will highly appreciate this wonderful feature! You can swap sides, choosing between green and black, depending on the fabric color you work with. 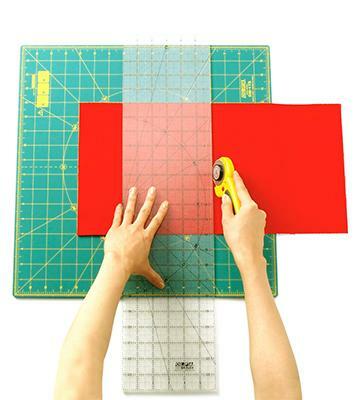 Besides an accurate cutting, art mats will protect your working top from any visual damage - chipping, rubbing, etc. Alvin engineers continuously work on improvement of their products. 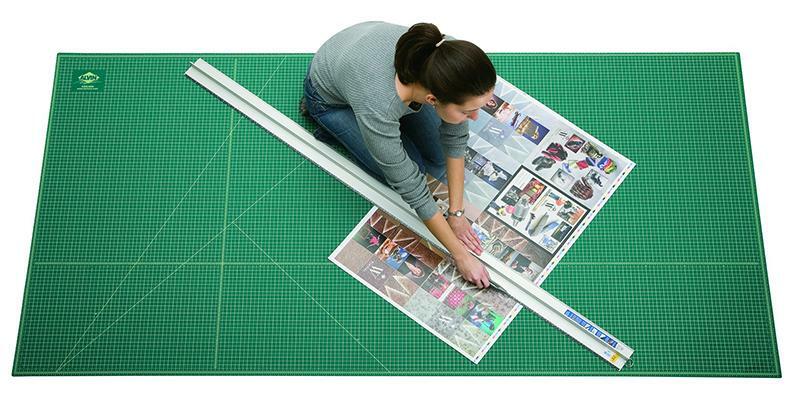 For example, they produce extra-large cutting mats good to protect surfaces larger than that of a table. They will help break the limits of your creativity! Now you can work on the floor, with enough space and all the materials at hand. 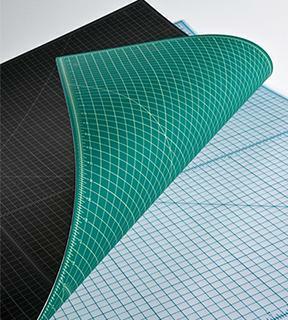 Each material has its peculiar density that defines the cutting mat's strength and durability. Some craft mats can be damaged or even cut through. Things are completely different with the Alvin cutting mat. You can cut almost all kinds of material on it! It seems incredible how this large cutting mat withstands such a pressure. It is strong enough even for cutting plywood or thick plastic. 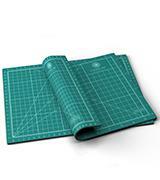 No wonder that functional and durable Alvin cutting mats are the popular professionals' choice! For fast and easy cutting out shapes and embossing figures, get a scrapbooking cutting machine. 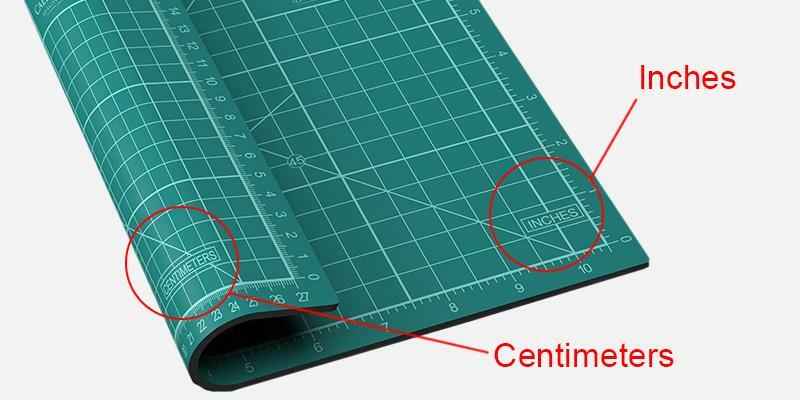 The manufacturer of this self-healing cutting mat emphasizes its durability and claims that the item recovers from cuts faster compared to its counterparts. How is it possible? It is all about unique innovative technologies. 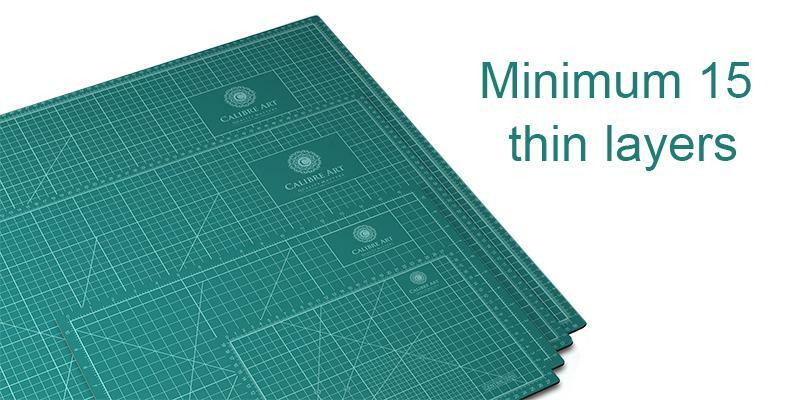 The Calibre Art cutting mats have higher material density, providing superior healing properties per square centimeter. The cutting mat has 15 thin layers of a self-healing material placed one over another when the previous thickness of material has been stabilized. As a result, manufacturing this type of cutting mat requires more time, yet the end quality is much higher. These cutting mats are heavier compared to the other models. However, they are more comfortable to work on, gentler on the blades, and more durable. 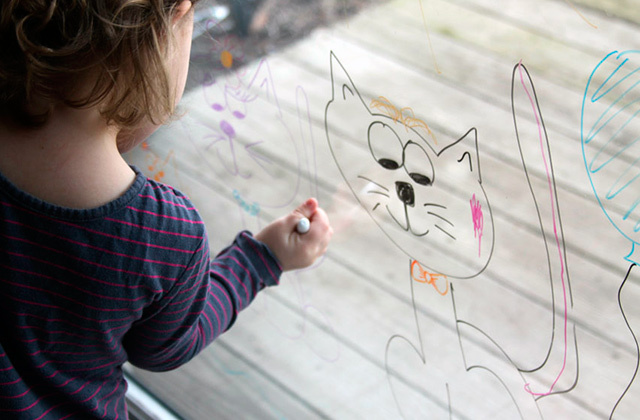 Save your time and money, creating on the Calibre Art mats! Working on a cutting mat is not a few-hours process, therefore it’s important that it doesn’t irritate your eye and doesn’t emit any unpleasant odors. Thusly, make sure to check on the compound the cutting mat is made of. 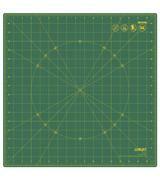 With regards to the Calibre Art cutting mat, it leaves no reason to doubt its high quality and eco-friendly properties. EN 71-3 certified, it contains neither metal nor other hazardous substances detrimental to human health, so you can spend hours over it and worry not about causing any harm to your well-being. Unlike a great number of available options, this one is surely odor-free and safe to use, even by kids! Cutting mats with a dual working surface are quite common today. However, there are very few boards with different markings on both sides. 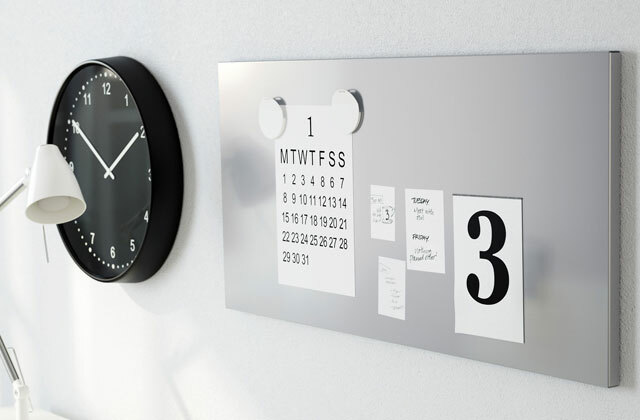 The Calibre Art features the inch markings on one side and centimeters on the other for more versatility of use. Besides that, it’s available in A1 size, big enough to accommodate there a large piece of fabric or paper. 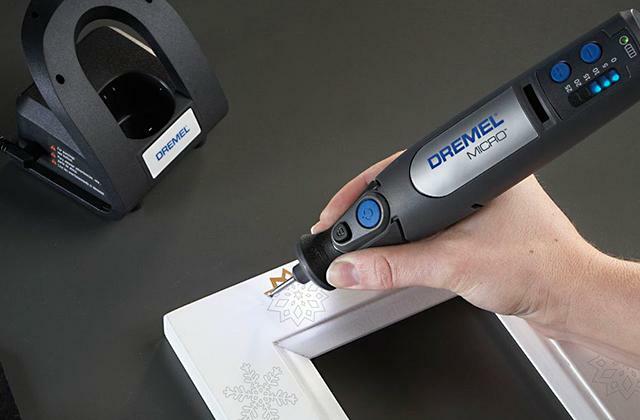 You can use it on a working table or on the floor and be sure that it won’t let you damage surface with accidental cuts or scratches. The Calibre Art self-healing cutting board is among the best choices for beginners and experienced quilters! 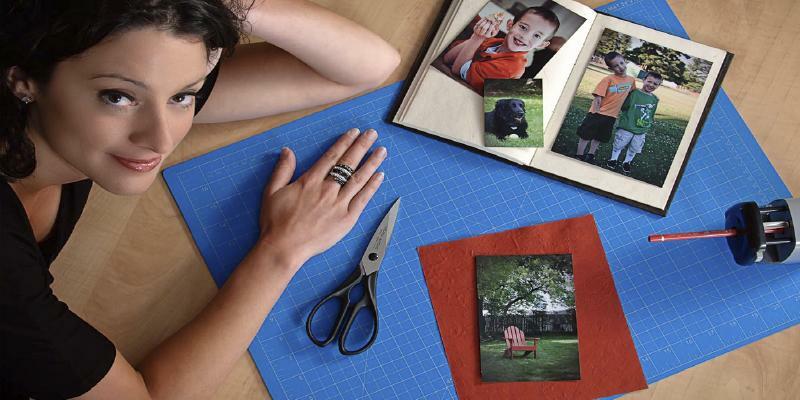 For those who love creating unique and beautiful things out of multifarious pieces, a durable cutting mat is a must-have. The Quilting Bee engineers have created a self-healing cutting board that answers the purpose! 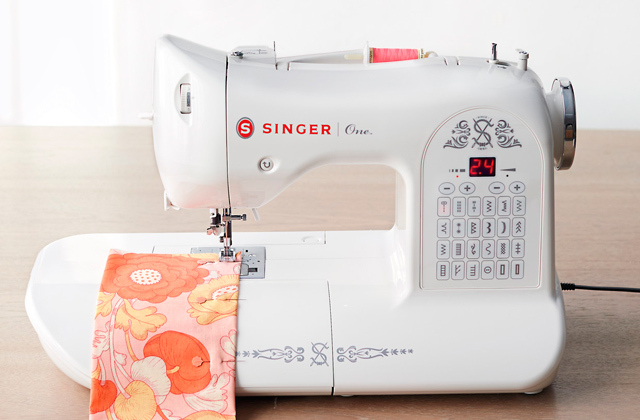 What does make it perfect for scrapbooking and quilting? First of all, the item has a unique two-in-one color scheme - blue background with white markings on one side and green background with yellow markings on the other. You can choose the side to work on depending on the lighting, fabric color, or your mood! 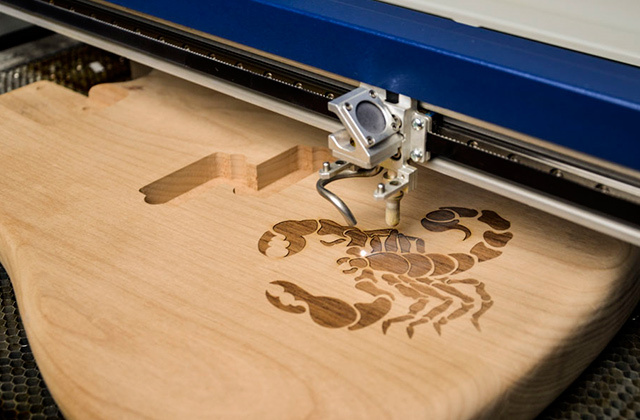 Furthermore, it is easy to cut out any complex shapes thanks to 30°, 45°, 60° angle markings. 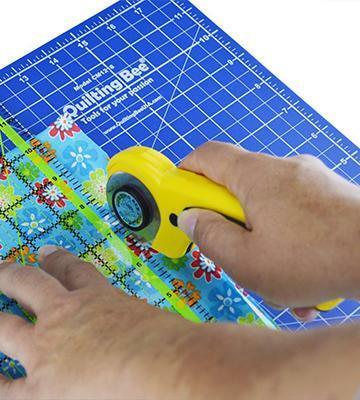 If used properly, the Quilting Bee cutting mat will serve you for years and will look just like new! Handicrafts appeared and became a significant part of a human life since times immemorial. Today, a lot of people take up some craft for one’s own pleasure. 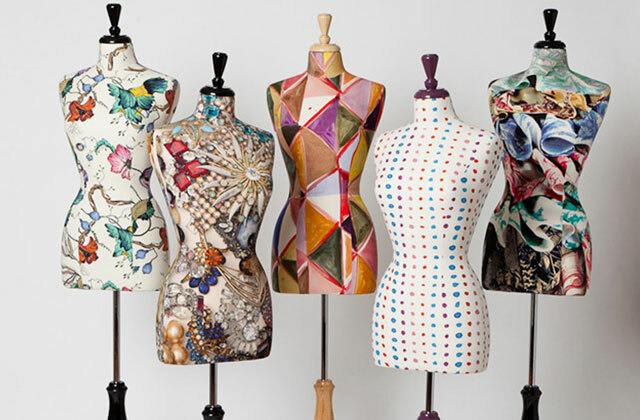 There are so many kinds of hobbies, such as sewing, knitting, embroidery, bead weaving, patchwork, decoupage, quilling. You can hardly list them all! Yet, we barely ever think how important handiwork is for our well-being, both physical and psychological. It is known that handwork stimulates our nerve endings. Whenever you, say, sew with a needle, you do a lot of good to your health! With a proper cutting mat at hand, besides health benefits, you'd be able to add to comfort of work too! 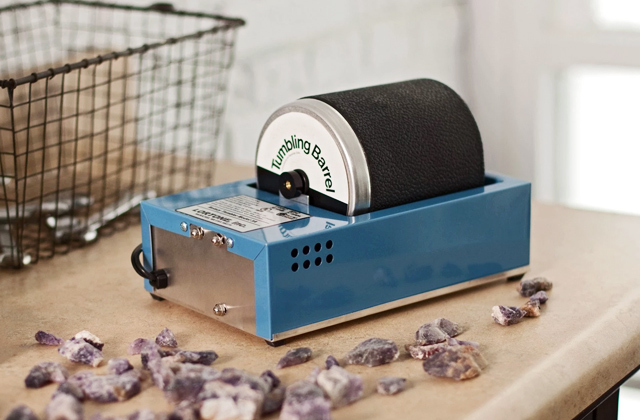 One more tool for creating stylish things with your own hands is a T-shirt press machine for fast and easy printing photos, images, and logos on fabric and clothing. Most patchwork, quilting, scrapbooking, modeling, applique, paper cutting, as well as many other art and handiworks are done at a desk using special blades. 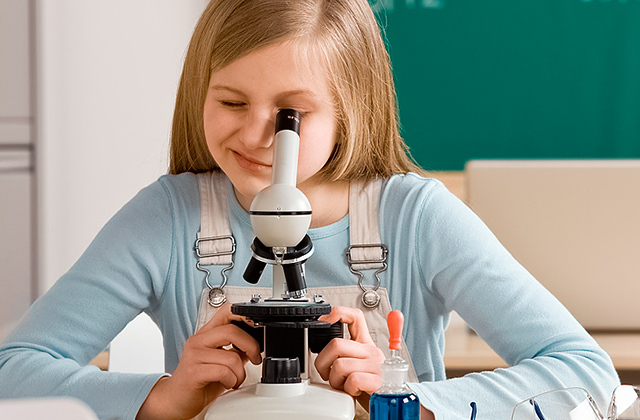 No matter how careful you are, it is difficult to avoid scratching the table and damaging it. Besides, working without a cutting mat is inconvenient and the results may be far from what you have expected. 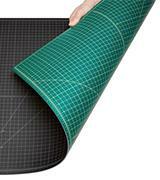 Craft mats have been designed to make your work as simple and comfortable as possible. 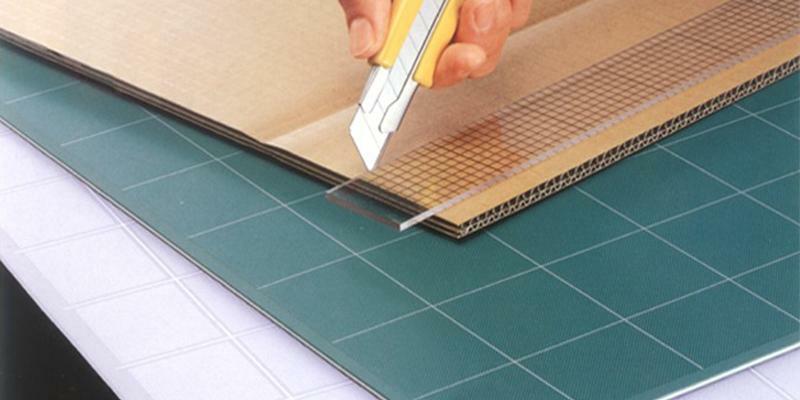 A cutting mat is a thick piece of a special material put on a working table or desk to protect it from cuts and scratches. Advanced technology and high-quality materials allow making self-healing cutting boards that won’t be damaged by a knife. On the other hand, these unique art mats don't blunt the blades! For faster and more precise cutting, it is advisable to get a cutting trimmer. 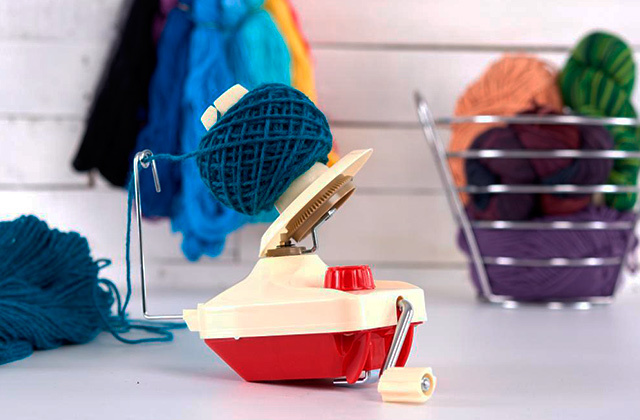 It is a must-have device in the up-to-date office or any handcraft workroom. 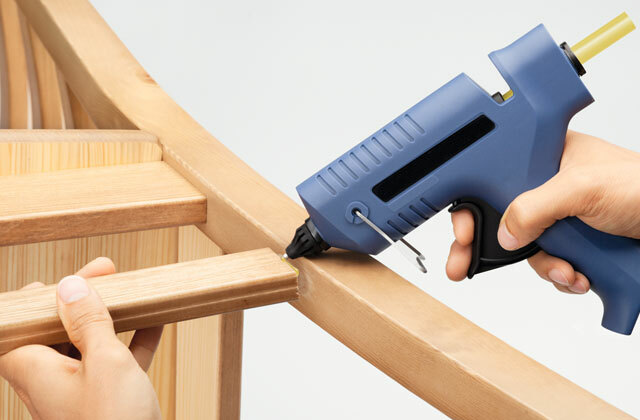 If you love handiwork, consider buying a handy craft table. Craft mats may vary in color and markings. Most common are green or blue with a white or yellow grid. There are also many other color schemes, but it'd be much better if you choose the one that doesn't irritate your eye and delivers a soothing effect during work. Pick a transparent cutting mat if you work on a backlit surface. The markings on a working surface can be of two types which are: Imperial and Metric. But you can get a cutting mat with a combined texture if that's what you need. 2. Self-healing Material, Wikipedia. June 24, 2016. 3. Kate Miller-Wilson Sewing Cutting Mat, LoveToKnow. 4. Kathryn Hatter What Are the Benefits of Arts & Crafts for Children? LIVESTRONG. February 2, 2014. 6. Handicraft, Wikipedia. August 10, 2016. 7. Olfa, Wikipedia. August 14, 2016.